We seem to have reached a plateau - well more of a dip recently - in our statistics, which isn't good. We've had site promotion ideas before, so we need to try something new. If you have any ideas please suggest them and we'll look into what we can implement. One idea I had to advertise on the big DIY store websites (both US and UK) proved to be too expensive for the potential gain - so if you've got a better idea than this please shout up. I'm not a regular answerer here, but I'm definitely a lurker. The main reason I started coming to the site was because I recently bought a home and had all sorts of issues to deal with that I had never encountered before. Is there an easy(ish) way to reach out to first time home buyers/owners, or people who recently bought a home in general? I think Google is the key. When I look for a solution to a problem Google is the #1 step and whatever is on top is always the best result. I never access a specific website in particular because I might lose potential solutions found on other websites. I don't feel loyal to any particular website, just to Google. That's how I discovered Stackoverflow. For DIY I discovered it thanks to Stackoverflow as well, and not Google. I think that's the main issue, the website is not ranked well and resources should be devoted to that rather than advertising. We could do a blog post, that has a .pdf to business cards we could print up. 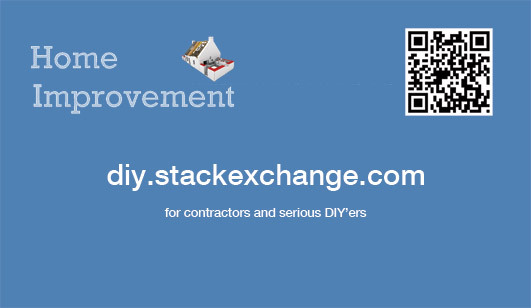 Carry them around in our wallets, and when a friend or colleague starts talking about stuff they're doing at home, hand them a card, with an "I've found this site extremely helpful for my DIY problems." What about adding a section - something to showcase projects? I know I'm proud of the work I've done to my house as I'm sure others have to - I often post DIY photos to facebook / twitter, etc... I could post them to DIY and link to it on facebook et all. People wanting to see my progress (as they usually do) would come here instead of staying at the social network. Just a complete stab in the dark in response for a business card from above; I obviously don't have access to the original artwork used on the site (logo, background, font, etc...) the url and tag line below are just Helvetica Neue Medium. I think the background used on the site should be the background of the card also. Write a 1/2 to 1 page article about the site, and submit to to various woodworking magazines. Or a longer article that includes a good project example. Subscribers of those magazines tend to be experienced but interested in learning more. Costs next to nothing, highly targeted userbase, and not very time consuming to do. Thinking out loud so please bear with me... I wonder if there is a way to leverage youtube? I visit it frequently for DIY stuff and I think having videos would drive more traffic here as well as be excellent supplementary content for answers. I guess the question them becomes what kind of youtube content to have and how to build it. Is it too late to try to bring back Broken House Chronicles, so that you can sponsor them, or advertise on there? Facebook is free and ubiquitous. Lots of diyers like talking about their projects on facebook and personal websites. If regular users -- say anyone who uses meta and sees this answer -- also posts relevant diy.se questions as part of their project updates it could help somewhat. Not the answer you're looking for? Browse other questions tagged discussion site-promotion advertising .